It is true… an avalanche is coming! It will hit the universities and change completely the nature of their organization, profile and mission. The avalanche has started already on the top of the mountain and finds its way downward. You don’t see it but it is moving faster and faster with great force underneath the surface. If you are experienced with avalanches you know that it will hit but you don’t know when, and if you are experienced with higher education you know why: Universities are giving away knowledge for free. More and more higher education institutions are opening up, in their business models in their leaning designs and in their access regulations. A huge pressure on the classical 20th century university is building up because its unique selling point – to be produces and shepherds of knowledge – no longer holds differentiating power when knowledge is made available for everybody or free. When knowledge is available one of the important future tasks of universities will be to give orientation about quality and to organize certification and assessment. The intention of this book is to lead the way to these horizons and discuss new emerging and more open forms and methods of quality development and assessment. Today we are seeing a new form of blended learning: not only is technology enhancing the learning environment but formal and informal learning are combining and there is self- and peer-assessment of results. 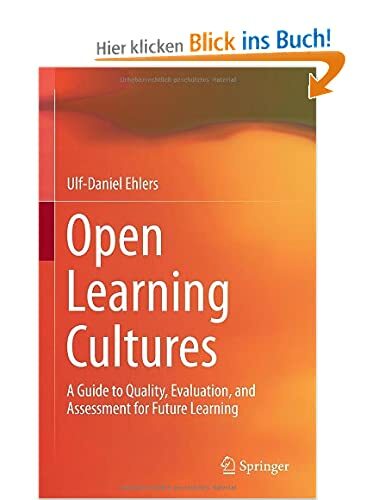 Open learning cultures are challenging the old and long-practiced methods used by educators and transforming learning into a more student-driven and independent activity , which uses online tools such as blogs, wikis or podcasts to connect resources, students and teachers in a novel way.